Free burrito! Free burrito! Free burrito! Baja Fresh is giving its Facebook fans a free burrito with the purchase of a large soda tomorrow (September 1). You have to have a Facebook account. If not, you gotta sign up. We haven’t quite figured out whether you have to become a fan of Baja Fresh on Facebook to get the offer, but we think you do. After logging into Facebook, you have to print out the Facebook page with the free burrito flier and the comments below it and bring it with you, along with a valid ID matching your user name from the top right corner of the printout, to redeem the offer. One offer per customer, ‘natch. Not valid with any other offer or discount, ditto. The offer is only valid on chicken, steak and carnitas burritos. It’s not valid on shrimp, mahi mahi, crispy mahi mahi, “Enchilado” style, and Dos Manos burritos. No word on the grilled veggie burrito, though. Good at participating locations only. Not valid at the following locations: Studio City; Westwood Village; West L.A.; Santa Monica; Brentwood; West Hollywood, Santa Monica Blvd. ; West Hollywood, Sunset Blvd. ; Miracle Mile; Sherman Oaks; Hollywood Blvd. ; Sunset and Vine; Century City; USC; LAX; Irvine, Main St.; Anaheim Hilton; Cerritos; Arroyo Grande; San Luis Obispo; San Diego Airport; San Ramon; Vacaville; Wheaton, MD; Pentagon Row; Bellevue; Excalibur Hotel and Casino; Tampa Airport; Marina Del Rey; Manhattan Beach; Long Beach; Torrance; and Westchester, LA. Apparently, the Inland Empire locations are participating. Why the restrictions? During a similar giveaway July 22, Baja Fresh was expecting to only give away less than 1,800 burritos, which was the number of Facebook fans when they made the original announcement. Of course, this being the Internet, everybody and their brother and sister and aunt and second cousin twice-removed found out about it and printed out the coupon. Facebook fans alone nearly doubled after the announcement. The company ended up giving away 50,000 burritos. Whoops! So, if you’re willing to jump through the hoops, more power to ya. Me? I’ll be sitting this one out. Out of 1,600 entries submitted online, the winner of Mimi’s Meaningful Muffin contest happens to be from the south end of the Inland Empire. Murrieta, to be specific. Linda Amendt, whose “Pineapple Coconut Crumb” muffin recipe was selected by award-winning pastry chef, acclaimed author and TV personality, Gale Gand, and Mimi’s Cafe Executive Chef, Adam Baird, will receive $1,000 in Mimi’s gift cards for her efforts. In addition, her muffin will be featured at over 144 Mimi’s restaurants until September 30.
fighting childhood hunger in the U.S. Recipes were judged on taste, originality and ease with which the recipes could be produced in large quantities. … and Daves and Davys. middle names will get entrees half off. Monday through Thursday. These specials are good 11 a.m. to 10 p.m.
Chipotle? There’s an app for that! Let’s say that you’re out running errands and you’ve suddenly got a craving for some Chipotle Mexican Grill. You don’t have time to stand in line and wait while everyone else decides what they want to eat. If you’ve got an iPhone, you’re in luck! Now there’s a free Chipotle app available here via iTunes. 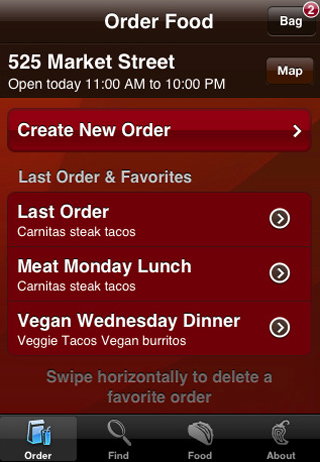 The app allows iPhone and iPod Touch owners to order and pay for their Chipotle orders via their handheld. They can also save their favorite meals, as well as the meals of friends, family and co-workers, which can be ordered as a group. The software will even find the nearest Chipotle for you. So…no more waiting in line! Just order and pay through the app, then pick it up at the restaurant. Of course, if you don’t have a iPhone or an iPod Touch, you can still order and pay through your browser at Chipotle’s Web site here. For reasons still unknown to me, I ate five bowls of pho in the last 10 days. I guess you can say I had a craving. I visited Pho Ha (both the Pomona location on Indian Hill and Holt and the Rancho location on Foothill and Hellman), #1 Pho Noodle and Grill on Foothill and Rochester in Rancho, Pho Vi on Thomas and 3rd in Pomona and Saigon Chinese and Vietnamese on Foothill near Etiwanda in Rancho. people-watching opportunities and proximity to a frozen yogurt joint. I asked the Pho Ha owner what the difference is between the two restaurants. She said customers in Rancho eat more. Ha, at the Chuck E. Cheese center, is always brimming with people. Mandarin. This isn’t your grandmother’s Cucamonga, that’s for sure. onion, carrot, baby corn, green onion, cilantro and shitake mushrooms. jalapenos and if you’re lucky, green leaf lettuce. Other restaurants I’ve tried before but not in the last 10 days: Pho Century in Upland; Pho Express and Pho Hoa Pasteur in Pomona; Pho 2007 in Chino Hills. Restaurants I’ve never tried before: Pho Saigon on Base Line and Carnelian in Rancho; California Noodle and Grill in Chino; Pho Nguyen in Fontana and Pho Vietrica in Ontario. For those of you who love both NASCAR and food, have I got a deal for you! As read in the number 3 item in Lou Brewster’s Fifth Gear column today, the Auto Club Speedway in Fontana is offering an all-you-can-eat “All Day Food Fest” pass for the October 11 NASCAR Sprint Cup Pepsi 500. The wristband pass, which will cost $35 for those 13 and over ($20 for those 12 and under), is good for one entre, one snack and one non-alcoholic beverage each time through the line at participating eateries. Of course, this is above and beyond your entrance fee to the raceway. Concessions include Canter’s Deli (Got that, Kristen? Now’s your chance! ), Gordon Biersch, Woodie’s, the Dog House, RPM BBQ, and the All American Grill. As you may have read in today’s Biz page, Zendejas’ Colton location has closed. The restaurant had recently remodeled to expand its bar and add a second dance floor, which ran afoul of the restaurant’s conditional-use permit with the city. Colton Police ordered the establishment to cease its nightclub activities as of August 1, and the owner decided to shut down. In other words, the restaurant couldn’t survive solely as a restaurant. Odd choice of wording, since that San Bernardino location has been open for years. Personally, I can’t remember the last time I ate at the Colton location. Or the San Bernardino location, which is only about a block from The Sun. You can read Matt Wrye’s full story here. Zendejas’ closing makes the third restaurant in that neighborhood that I’ve noticed has gone belly-up. But Joan’s Broccoli Madness? Broccoli and raisins together? Madness, indeed. Obviously, I’m not a fan. And perhaps you have a Costco membership. If so, you’ll be glad to know that Costco now carries a kit that includes enough ingredients to make 10 one-cup portions of the broccoli/cashew/raisin salad. The kit even includes a bowl to mix it in. I have a Costco membership. Sorry Souplantation, but I’ll be leaving that kit on the shelf. When you come up with a kit for your Spicy Southwestern Pasta, let me know, OK? I’ve been curious about the Coca-Cola Freestyle 100-plus choice soda fountain ever since I read about it online earlier this year. Then I found out that Coke was test-marketing it here in Southern California, in select San Diego and Orange county restaurants. This past Saturday, I got to experience it for myself. I drove down to the Subway shop at 2514 E. Chapman Ave. (at State College Boulevard) in Fullerton (after a detour to a different Subway further down Chapman…oops!). 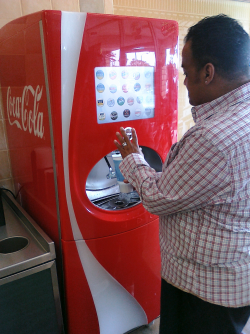 The Freestyle machine itself is about the size of an apartment-sized refrigerator. It has a single opening through which both ice and soda are dispensed. On the front is a touchscreen menu for selecting your beverage and a Pour button. There are 10 basic brands available (Coca-Cola, Dasani, Minute Maid Lemonade, Fanta, Pibb, Hi-C, Sprite, Barq’s, Vault and Powerade) most in both regular and diet (or in Coke nomenclature, Zero) varieties, for a total of 20 different available base beverages, plus plain old water. If you’re a night owl, like me, or an early bird, unlike me, you just might have a chance at getting a year’s worth of sandwiches from Togo’s. You see, the Upland Togo’s (110 S. Mountain Ave., at 8th Street) is celebrating their grand opening this morning (August 15). To commemorate the occasion, they’re giving the first 50 adult guests (18+) in line free sandwiches for a year! That’s one sandwich a week for 52 weeks. You gotta be at least 18 years old and have a valid California driver’s license. You must purchase a 6″ Togo’s sandwich. You’ve got to stay in line and be in line when the doors open at 10 a.m.